Ah…the good old days when it was just about cooking. Remember those days when your stress, considerable as it may have been, was focused on your mise en place, keeping orders straight on your station, making sure that your knives were sharp and your station clean and organized, being sharp and alert, and taking those extra few seconds to make sure that plate presentations were spot on? Now you are a chef and everything is different. You are in this new position because others trust and expect that you will be a consummate planner, a strategic planner, a problem-solver, the person who has the answer to every question, and the solution to every challenge. Decision-making takes on a new dynamic when your jacket says: “Chef”. Most chefs relish those rare times when they can tie on an apron, take on some prep, fill in for a time on a line station, orchestrate through the expo station, or even run a few trays of dishes through the machine. It is the weight of decision-making that takes its toll on chefs and the feeling that the chef must be there when those decisions are called for – thus a primary reason for the excessive hours on the job. So, what decisions are now on a chef’s desk that might not have been there before, and how can the challenge be met- head on? 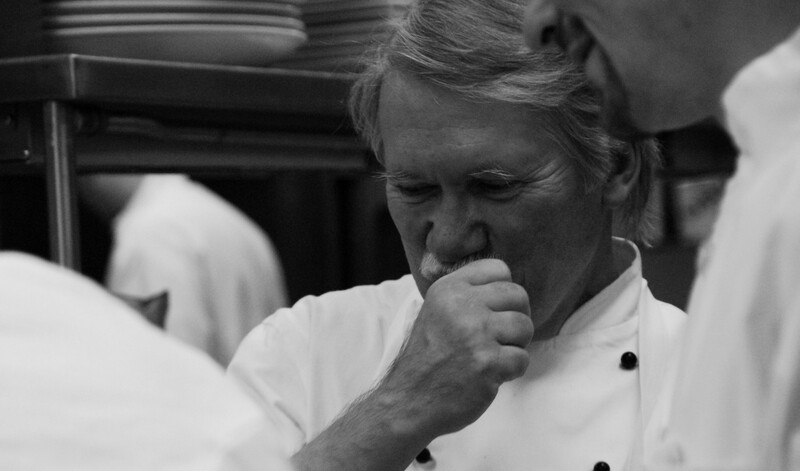 Although one of a chef’s most pleasurable tasks – menu planning is on going, and sometimes – relentless. Decisions with regards to menu must factor in the desires of the guest, the financial viability of a menu item, the availability of the right ingredients, the ability of the kitchen team, the right equipment to pull it off and whether or not the choices are reflective of the restaurant brand and philosophy of the chef. Each item must be tested and proven workable and then executed consistently. Menu decisions should never be taken lightly. Selecting vendors must go beyond their ability to provide the ingredients ordered – the chef must make decisions based on service, price, payment terms, and most importantly – trust that the vendor will live up to the purchasing agreement standards. A chef will (and rightfully so) spend more time with hiring the right individuals who will complement the kitchen team, than anything else. Hire right is more complex that simply finding cooks and other team members who have experience – it involves team chemistry, professionalism, dependability, commitment, and passion. The wrong decision with hiring will cause a ripple effect through the organization. One over-riding reality in any business is an understanding that every employee is different. As a result, the most effective leaders (in this case- the chef) must learn how to treat every employee the same (standard performance requirements), yet everyone differently (discovering and reinforcing individual strengths and providing the right support to correct or complement weaknesses). Every interaction with an employee involves a decision that will prove to be either effective or ineffective. Chefs wrestle with making the right choice. Cooks may know that they are responsible for controlling waste and as such impacting the financial success of the restaurant, but it is the chef who has to build and live by the budget and make the sometimes tough decisions that lead to meeting the demands of his or her projections. What a chef wrestles with is a balance in decision-making that considers a commitment to quality, an understanding of time and deadlines, the abilities of the kitchen team, storage space, and efficient use of kitchen equipment. Scheduling may seem like a lock-step process – but it’s not. Demands on position schedules can change daily in restaurants with the ebb and flow of reservations, last minute bookings for banquets, and the never ending call outs that need to be filled. On top of this, the chef may try to accommodate special requests for days off, vacations, etc. Scheduling decisions impact every individual and the operation as a whole. The worst feeling in the world is to be caught with a situation that you have never planned for. Effective chefs are planning in advance so that crisis decisions can be made from a well thought out advance process. Power outages, snowstorms, late deliveries, coolers breaking down, the dish machine off line on a Saturday night, a wave of sick employees calling out, etc. One thing for certain – all of these situations (and many others) will occur at some point. Plan in advance so the decision is easy. Sometimes chefs need to make decisions to enhance or at the very least – protect the brand of the restaurant as well as his or her personal reputation. These issues are never easy and require a strong will, a determination to not sacrifice those stakes in the ground, and do what is right vs. what may be most expedient. The more you engage your staff members in the decision making process, the more they are in tune with what is going on and what your expectations are – the easier those decisions become. When you don’t have to stop and explain why, or even worse simply drive a decision without apparent consideration for the employee – the less likely you are to encounter resistance. Training is always the key to fluid decisions. When your crew is well trained, the more likely they are to not just support the restaurant leadership, but also oftentimes rectify a situation before the chef is required to intervene with a decision. The most effective managers are great delegators. However, this delegation is only effective if employees are well trained with regard to the task that is passed on to them. Well-trained employees can and should be empowered to make their own decisions. When they understand how their decision impacts others then they are much more likely to act in the best interest of the operation. The caveat is that empowerment reaches beyond responsibility – empowerment only works when the authority to make a decision and support for their decision is firmly in place. Responsibility without authority is useless and ineffective. Part of every employee’s evaluation should be how well he or she executes this empowered responsibility and the additional duties that the chef delegates. What gets measured – gets done well. When this happens then the chef will have the ability to shed some of the stress of decision-making. Trust happens when delegation is supported with training, responsibility, and authority. Trust is one of the most powerful motivators and the key to a chef winning the ability to be most effective in his or her position. Of all these decisions -staff issues with hiring, retainment, motivation, and recruitment are the most challenging in today’s kitchens. I rarely talk with another chef who is fully staffed. This problem creates an undo burden on the chef and the rest of the staff which circles back and creates more issues. Thanks for the great posts!